With white twinkle lights, strings of candle lights, hanging balls and baubles, and frosted silk poinsettias with gold ferny sprigs tucked behind. All that glitters may not be gold, but it sure makes things sparkle and glisten when the lights are turned on. It's a lovely place to sit and 'just be'. 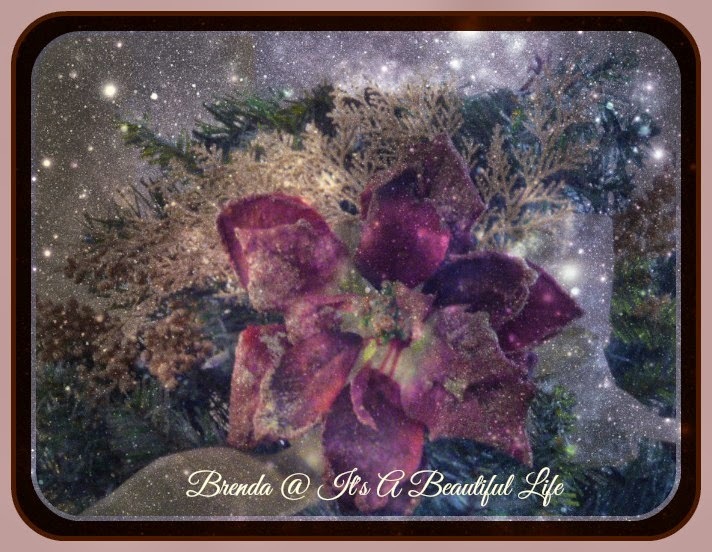 I took one of my photos of a frosted silk poinsettia and added all manner of festive textures using PicMonkey. In this instance, we used the "Space" texture which creates all the little orbs of lights. I do adore trying out all PicM's framing options too; there is no doubt that a frame takes an ordinary photo and dresses it up so one can take it out on parade. 3. 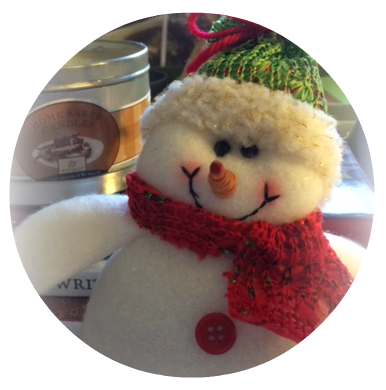 Our final Christmas Giveaway "Tea for Two"
Today we announce our third and final Giveaway this month. It will be a sweet treat bag of goodies that includes such items as would befit a Tea for Two party. Invitations, luncheon serviettes, tea, and sweet treats. The DRAW is now closed. Something to read link. Should you be looking for some other seasonal reading, I invite you to my Restoring the Joy At Christmas Advent countdown page. 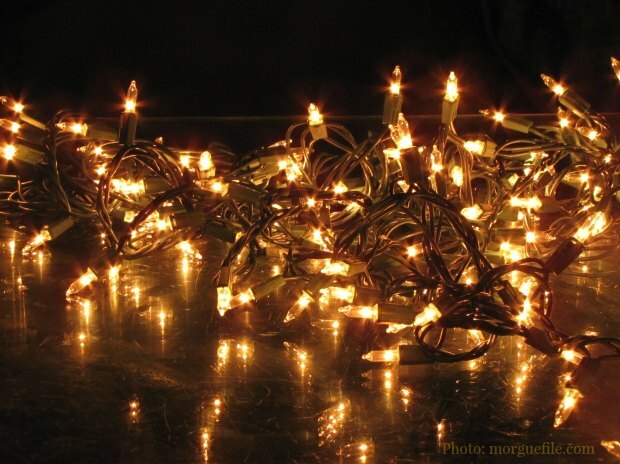 Originally featured on my blog in 2010, this year I took the bits and pieces, sorted them out (much like one would untangle tree lights), updated some, and added new material to create 25 short posts. Each one offers a simple thought about JOY during this busy time of year. New posts are being added daily December 25th. Something to decorate link. If you are still looking for ways to add festive touches to your home, you might enjoy reading blogger Heather Preston's list 40 Christmas Decorating Ideas that are meant to bring joy to your home. It's a delightful list with some great photos. Something to create link. Do you crochet? If you do, you are bound to enjoy this site by Anna at Outrageous and Wonderful who shows us how to make the sweetest lacy tree ornaments. 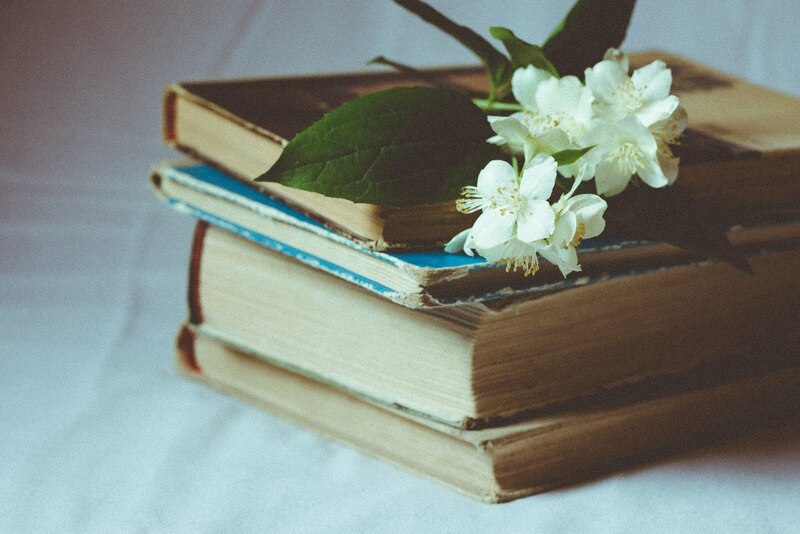 There are instructions for a tiny star, a tiny tree, and a tiny heart. You are so clever with your photography Brenda. I get muddled with Picmonkey! 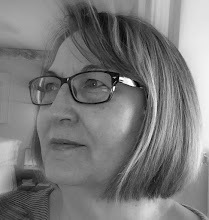 Dear Brenda - your photos are always beautiful. Have been wanting to give Picmonkey a try - hopefully after Christmas I will get an opportunity. In the meantime I am going to enjoy yours and check out your links. Have a wonderful day my friend. Picmonkey is really fun to use. I love to put frames around pictures, as it really does add to the look. Your pictures are always beautiful. I'll have to take a look at your crochet recommendation. Please put my name in your draw. I know someone I'd like to have tea with. Just coming here puts me in the Christmas mood!! to participate in the tea drawing - thank you for all you do! 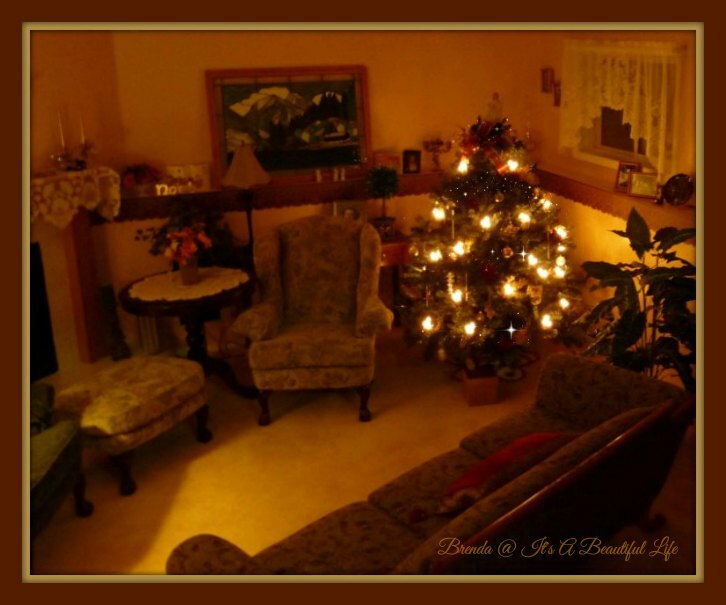 I like playing with PicMonkey too and have never tried the space option - it looks very nice over your photo. 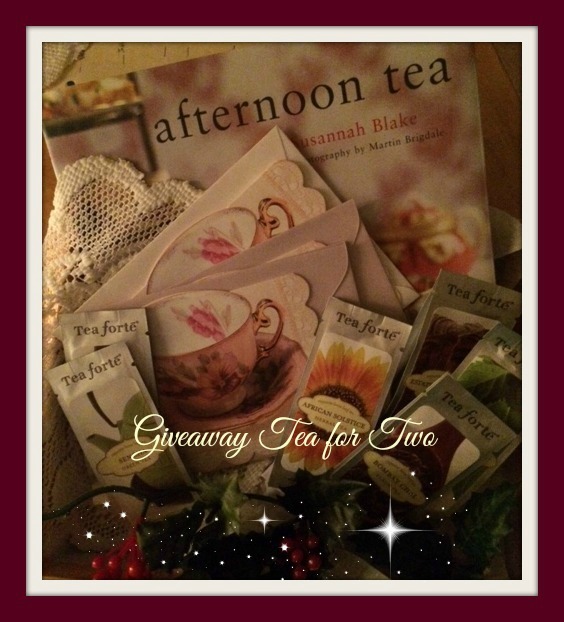 Tea for two would be a delightful giveaway to win. It is a perfect gift for a tea loving English woman! Your photos inspire your words engage. Tea for two sounds delightful! 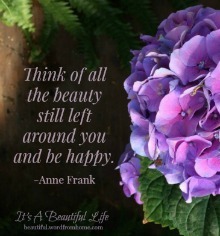 I like PicMonkey, too, although I usually stick with collages. Great links to other sites, Brenda. I'm off to look at your Advent pages. I should look into Pic Monkey. I was immediately struck by your Space texture - I love it! And I'd love to win tea for two :)! Not to make a pest of myself, but I just have to THANK YOU for mentioning Pic Monkey. I've given it a try and oh my goodness!! I feel like I got a Christmas gift!!!! Nancy, I'm coming to look for samples when you get some up! Glad it worked! I'm getting behind on my reading !! But glad that I saw this giveaway. Yes, enter me please. Now to check out some posts I got behind on, and your Advent reading. Thanks Brenda. Brenda, Thank you for such a beautiful, joyful place to spend time. I love your blog. Please enter me in the Tea for Two giveaway, I'd be delighted if I won. I love it. Thank you. Judi H.
Hello Judi H. You won the Teat for Two giveaway!!! Congratulations to you.. we hope you will enjoy the treats. When you see this reply, please get in touch with a mailing address (my email is in the sidebar). I posted the winner on Friday's post, Dec 19. Judi H. If you see this reply, you won the Tea for Two Giveaway over at It's A Beautiful Life. Please get in touch with a mailing address (my email is in the sidebar). Congratulations. I posted the winner on Friday's post, Dec 19.